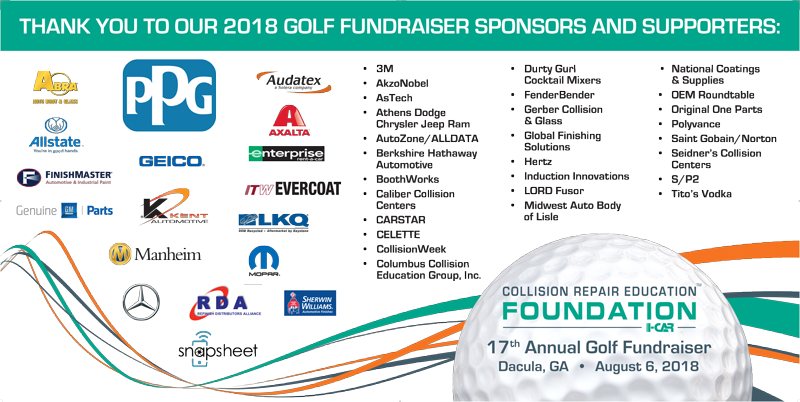 The Collision Repair Education Foundation’s 18th annual golf fundraiser will be held Tuesday, July 23rd, 2019. Golfers will enjoy a round of golf at Brickyard Crossing Golf Course (Indianapolis), voted in Top 100 American Public Golf Courses by Golf Digest and Golfweek. This course has 4 holes inside the oval and 14 holes adjacent to the backstretch of the Indianapolis Motor Speedway. Don’t miss this opportunity to join us as we race to help support the future professionals of the collision industry. Date: Tuesday, July 23rd, 2019 – Lunch: 11:30 a.m. / Tee Off: 1 p.m. The event will be held in conjunction with industry events including the Collision Industry Conference and MSO Symposium taking place that week in Indianapolis. Join the Foundation for a great time and help raise additional funds for a great cause. Sponsorship opportunities are now available. Contact Director of Development Brandon Eckenrode brandon.eckenrode@ed-foundation.org. for an updated list of sponsorship opportunities.